What Makes James Hardie® HardiePlank Number 1? 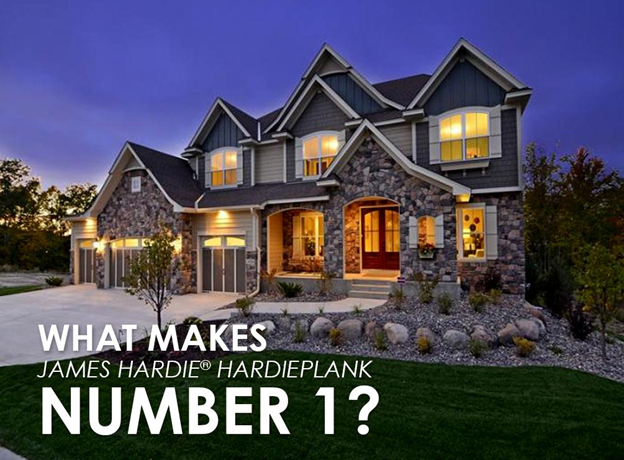 Home » What Makes James Hardie® HardiePlank Number 1? You’ll be relying on your siding to keep your home’s exterior damage-free from the harshest weather. That’s why you need to make sure your choice of siding material can provide the reliable performance you need. For many homeowners across the country, one option remains on top of the list—fiber cement from James Hardie®. This excellent choice uses all-natural materials, including cement, sand, and cellulose fiber. Unlike other siding options, fiber cement offers superior resistance to elemental damage, rot, and warping. As your expert in siding in Connecticut, Vinylume carries the James Hardie® brand for our exterior services. It is available in a variety of excellent styles, all using this highly durable material. These include HardiePlank® Lap, the most used fiber cement siding in the country according to the 2016 BUILDER Brand Use Study. The data covers November, 2015 through January, 2016. They are based on 1,308 responses from the survey conducted online, along with BUILDER print subscribers. Beautiful, Maintenance-Free Colors. HardiePlank Lap Siding is available in a range of lovely baked-on finishes via exclusive ColorPlus® Technology. This system works by applying multiple, consistent coats on fiber cement siding in a controlled environment. This results in attractive, durable finishes that last longer than a regular paintjob. Superior Weather Protection. HardiePlank Lap siding can handle Connecticut’s weather conditions. This is possible through the HardieZone® System, which provides siding with particular performance attributes relative to the area’s climate. When you choose Vinylume for your siding installation, expect your James Hardie exterior to stand up to the harsh elements. Turn to Vinylume for reliable James Hardie fiber cement siding. With our excellent selection, we’ll maximize your home’s beauty and weather protection. You can also count on us for vinyl siding in Connecticut. Call us today at (866) 244-8026 or fill out this form today for a free consultation.